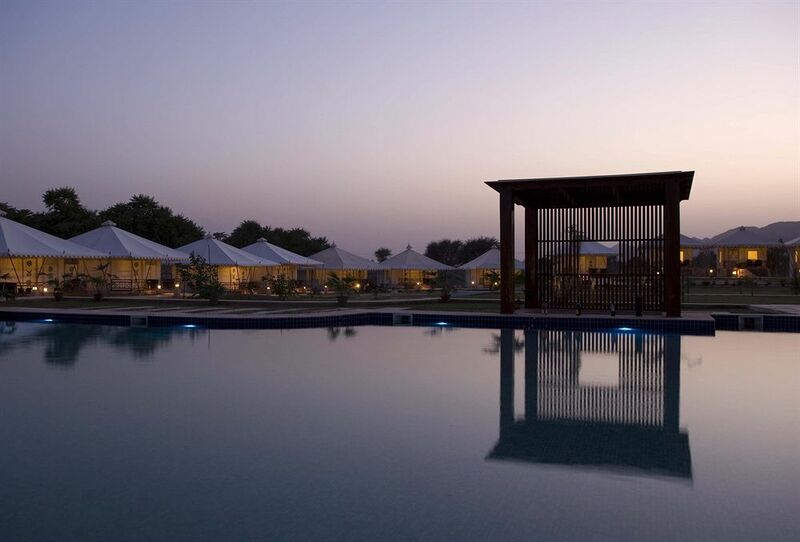 Green House Resort Pushkar is a four star luxurious eco-boutique resort that is situated 10 minutes away from the city centre of the famous city of India, Pushkar, Rajasthan. The resort is spread over 10 acres of land that are used in raising good quality of Dutch roses and gerbera flowers, vegetable gardens and for growing strawberries. 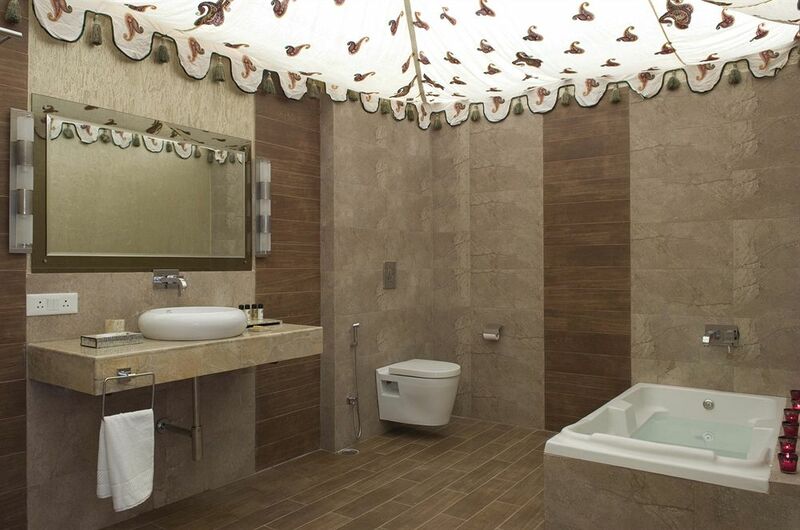 The greenhouse resort also is quiet famous for practicing eco-friendly activities such as energy conservation, solar water heating system, using of energy efficient lamps, etc. 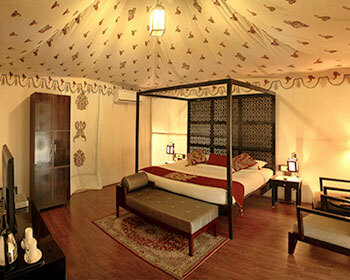 The resort offers 20 luxurious tents to its guests which are divided into Superior tent, Premiere tent and Suite tent. They are well spaced so that the privacy of the guests is maintained. Each tent also comes with a private sit out. The resort also has a multi-cuisine restaurant to serve the guests with culinary delights. It also has an open air dining and a bar to relax. The hotel has a spa and a swimming pool with Jacuzzi and sun beds, umbrella and loungers around the pool. The hotel has a conference hall to satisfy the needs of the business clients. 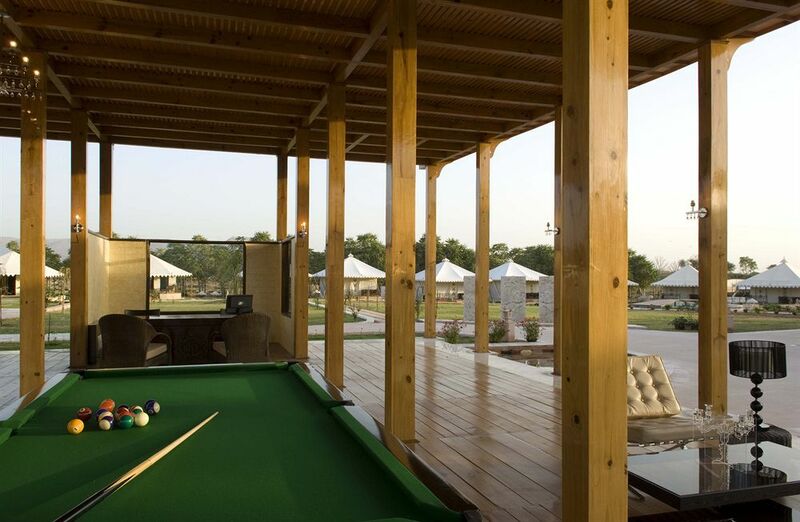 It also has a Kids club and arranges for various recreational activities. The resort also arranges for sightseeing trips. Thus, it is ideal for both business as well as leisure travelers. 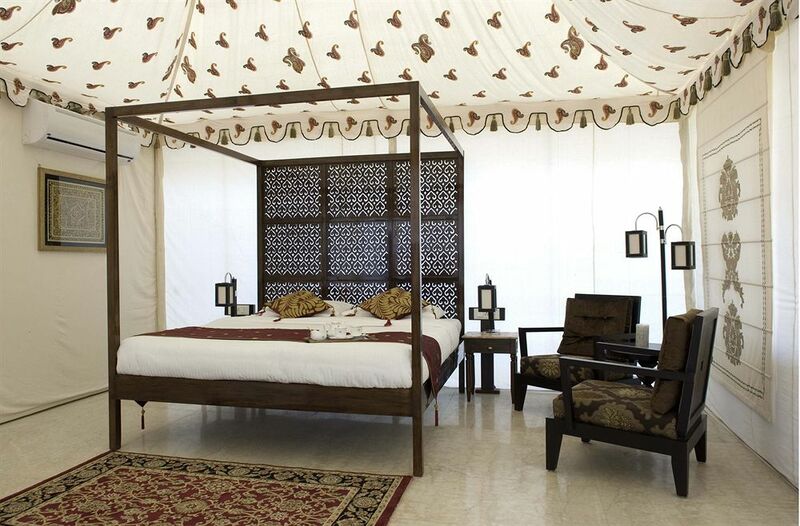 Each of these tents measure 450 sq ft and constructed with a canvas with a canopied style of ceiling. 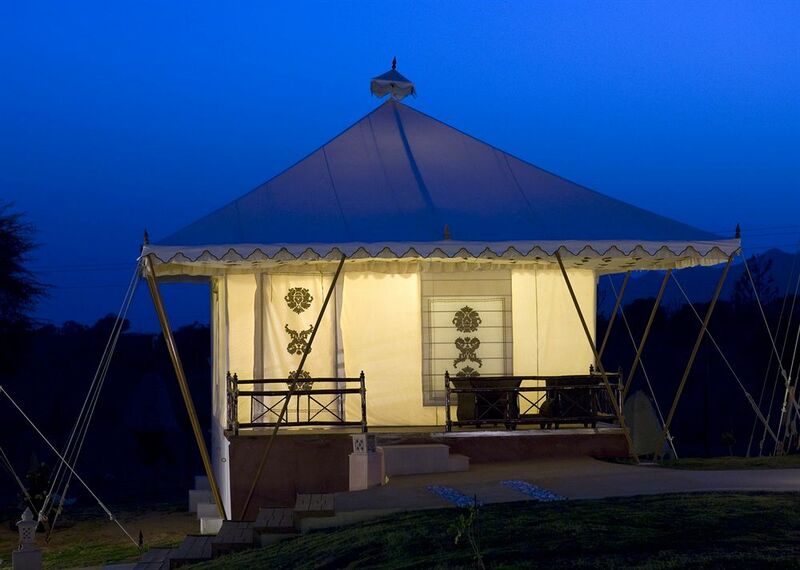 The tents also come with outside wooden deck for sun bathing and it also offers wonderful view of the surrounding. The amenities provided are attached bathroom with shower cubicles, 24 hrs hot/cold water, 24 hrs room service, toiletries, bathroom amenities, tea/coffee maker, air conditioner, iron/ironing board, hair dryer, housekeeping, laundry/dry cleaning, safe deposit lockers, telephone with STD/ISD, Television with satellite connection, doctor on call, parking and much more facilities to make the stay of the guests memorable. These are ideal for those who look for a lavish and exotic accommodation. 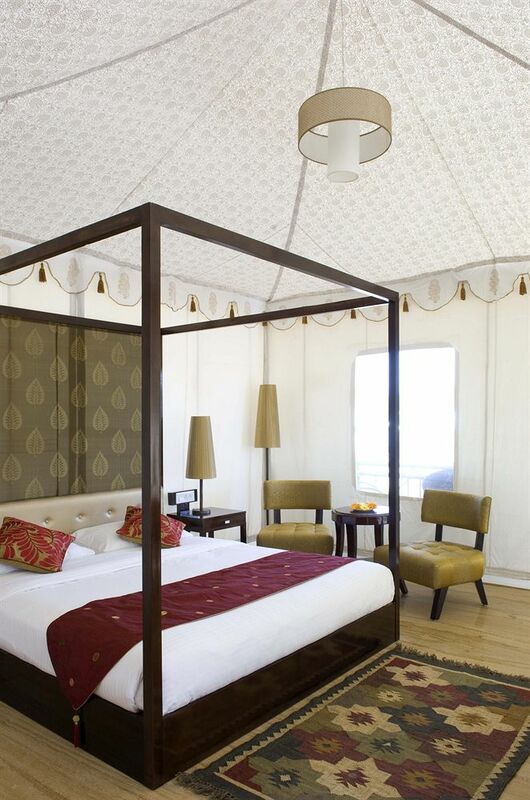 The 575 sq ft elegant and luxurious tents come with wooden carved king size four poster bed and the tent has spacious sitting area with a study table and wardrobe. They also come with all modern amenities and a wooden deck with comfortable chairs. Further these rooms are provided with amenities like 24 hrs hot/cold water, attached bathroom with beautiful tiles and shower cubicles, bathtubs, 24 hrs room service, bathroom amenities, toiletries, air conditioner, tea/coffee maker, hair dryer, iron/ironing board, laundry/dry cleaning, housekeeping, telephone with STD/ISD, doctor on call, Television with satellite connection, parking, safe deposit lockers and many such facilities. These are ideal to stay with your family and provide you with royal experience. 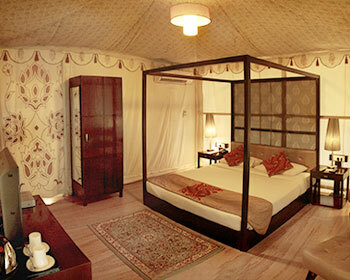 These suites measure 850 sq ft each and are quite spacious, luxurious and comes with elegant interiors. These are the unique feature of the Green House Resort. These tents have a patio that overlooks the swimming pool. The amenities available are bathtubs, attached bathroom with beautiful tiles and shower cubicles, bathroom amenities, 24 hrs room service, toiletries, 24 hrs hot/cold water, tea/coffee maker, air conditioner, iron/ironing board, hair dryer, housekeeping, safe deposit lockers, laundry/dry cleaning, doctor on call, telephone with STD/ISD, parking, Television with satellite connection, etc. 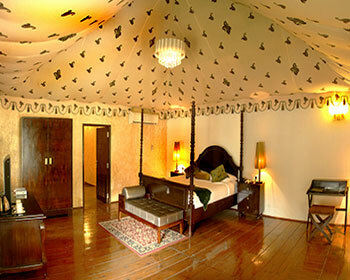 These are quite spacious and are ideal for a grandeur stay. The restaurant is well adorned and tastefully done with gerbera flowers. The whole restaurant is decorated with different kinds of flower and it will make you feel close to the nature. 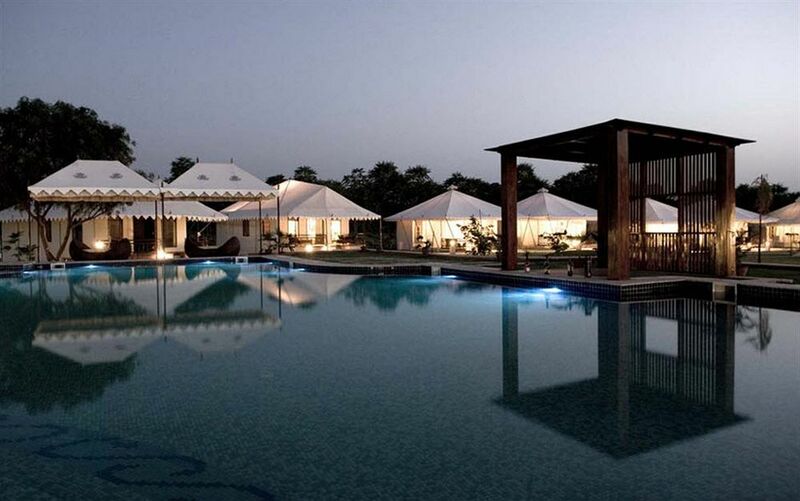 The 24 hrs delectable multi-cuisine restaurant serves Rajasthani, Indian, Chinese and Continental cuisines. All the vegetables used in the cooking are grown in the resort itself. The food served is both scrumptious as well as sumptuous. The restaurant also has a bar for and small lounge for the guests to enjoy the drinks and snacks. The food served which also includes the local delicacies will be a feast to your palate. The guests can also enjoy their food and snacks in the pool side open air dining hall. They will also be entertained by traditional Indian music as well as dance. The wooden pool bar located near the pool is well stocked with domestic and international alcohols and spirits. You can enjoy your drink along with lip smacking snacks at the pool bar. It is an ideal place to have a business chat with your client by sipping the beverage of your choice or just relax with your friends or colleagues by enjoying your favorite drink.